These actors appeared in the play Tsumagasane Urami no Samezaya performed at the Chikugo theater in 8/1851. These two prints are unsigned, but are firmly attributed to Hirosada. These two images are known in a different printing. The other one was probably the more commercial of the two. The examples in the Lyon Collection make liberal use of metallic ink and have different inscriptions. Clearly these could be from a little-known deluxe edition. Furuteya Hachirobei first appeared in 1773 in the bunraku play Sakuratsuba urami no samezaya (桜鍔恨鮫鞘), 'The Inauspicious Sword'. Hachirobei was also featured in a joruri play Sakamachi Yoi no Yotsutsuji in 1785. 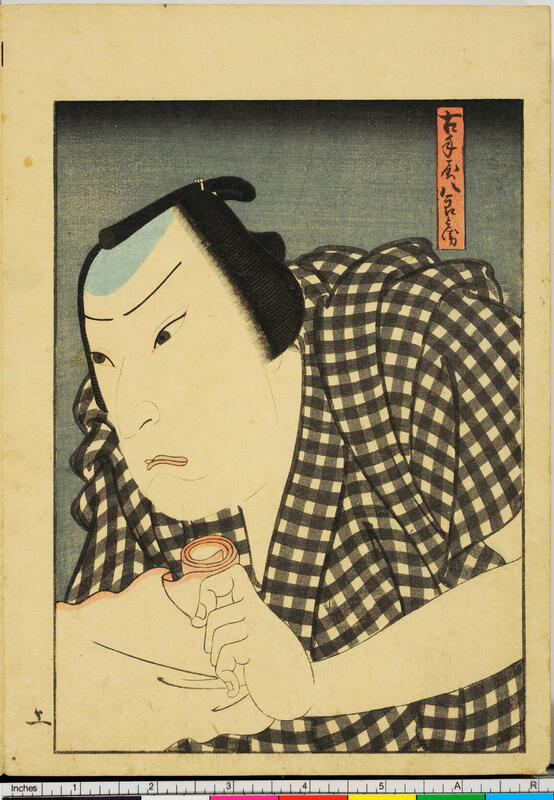 He reappeared in a kabuki play, Sono sakazuki iro no mitsukumi, by Tsuruya Nanboku IV in 1815 - or before. 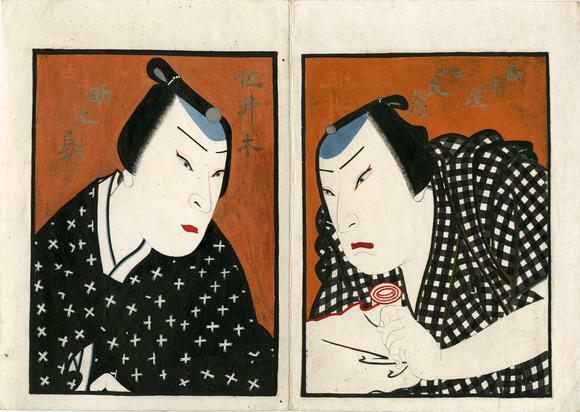 Notes about an 1861 Kuniyoshi print in the Fitzwilliam Museum say: "The Otsuma and Hachirobei story was the subject of various Kabuki and Bunraku plays, although the exact performance related to this print has not been traced. It tells how Otsuma prostitutes herself to raise money for the cause of the lord of her husband Hachirobei. Not realising her selfless motives Hachirobei kills her in a rage." 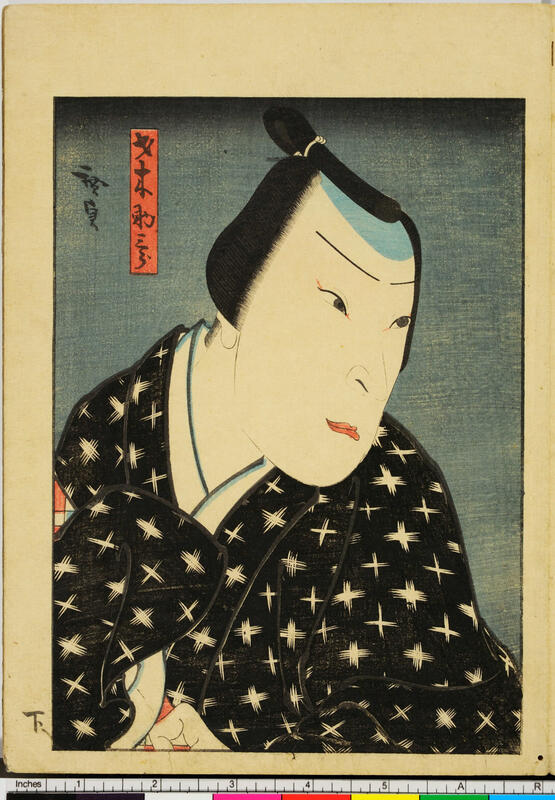 In Kabuki Heroes on the Osaka Stage 1780-1830 in a chapter devoted to the career of Arashi Rikan II (1788-1837) there is a reference to an ehon which deals with the character Hachirobei. "This version was first performed in Osaka at the Naka Theatre in the eighth month, 1764, soon after the notorious murder of a woman in that city. In the play, Furuteya Hachirōbei kills his wife and mother who plan to reveal his attempt to steal money that has been set aside to save a princess. Hachirōbei eventually confesses and commits suicide to atone for his crime."